For starters, there are some very imaginative, catchy and unexpected songs for the soundtrack. They might even be the most unique part of the movie. I did not recognize any of the songs, but some of them were good enough to make me want to look them up! The animation is pretty good. When I saw the cover, I instantly thought "Oh no, weird CGI robos!" (heh, well, mabye its a bit accurate...)but it is much better than some movies I've seen. The action scenes have the best examples of animation, and I feel like a lot of work went into the design of the environment of the main town and of the mechanical things. While it isn't incredibly unique here,it is pretty. The best things about this movie, however, are its concept (not necessarily its plot) and conduction of viewer emotion. I don't want to spoil the plot for anyone, but I can say that the stakes of the heroes actions become higher and higher as the movie goes on, and its hard not to get invested when the action kicks in! There were a couple parts that really got me good when it came to actually feeling for some of the characters (despite the personality thing mentioned above). I think it invokes a sort of "situational empathy" that was very interesting. On that note, I'll mention that there might be one smile in the whole movie. ONE. It is ultra serious. In summary, it was a fun ride. I didn't take it too seriously, but it does have an interesting message overall, mixed in with some adrenaline-pumping action scenes and a few feels. It won't change your life, but it is fun to watch. I'm not a huge fan of this genre, but I still liked it...so from an outsider's perspective, its good! It's not a must-see, but if you get bored, keep Vexille in mind. A well executed & visually appealing Sci-fi movie. 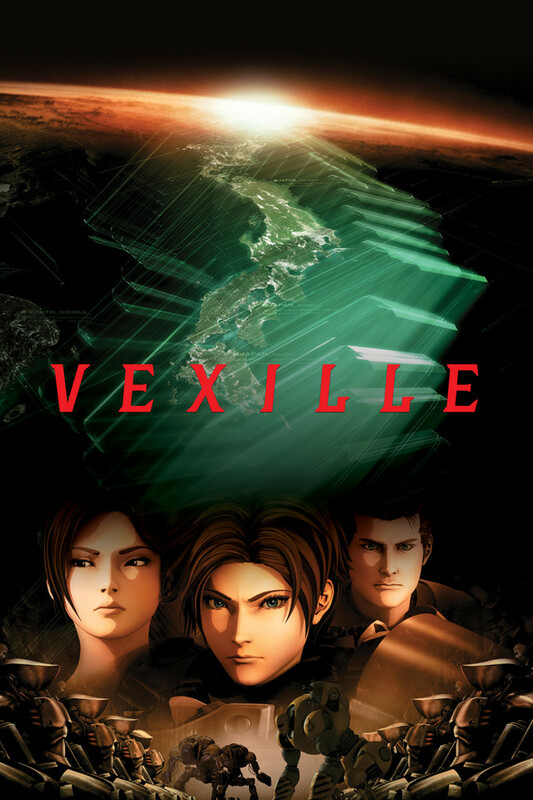 I own Vexille on DVD since close to its English release back in the day. It was back when I found out about Apple Seed as a movie and series. If Apple Seed is your jam, you should also appreciate Vexille. It has its weakness (some in its scenario and mostly in its characters), but the overall experience is great. Those weakness are mostly due to the down side of it being a movie instead of a series. They got 2 hours to explain and display way too much information and that end up weak. Still, even so, the quality of the presentation, the audio/sound and the appeal of the design and setting makes up for the weakness previously explained. For whatever lack of characterization in each characters, their actions and the overall scenes surrounding those keeps the entertainment relatively high. The bad sides of the scenario is mostly the lack of preparation and presentation that make any sens. It's displaying the setting as if everybody already knows what's happening in the world inside the movie and as if "nothing is new" and "all is expected". The small amount of surprises displayed by the characters makes them a bit unbelievable due to that problem. Still, I really liked watching Vexille and it's still in my "Watch at least once per year" list of animated movies.